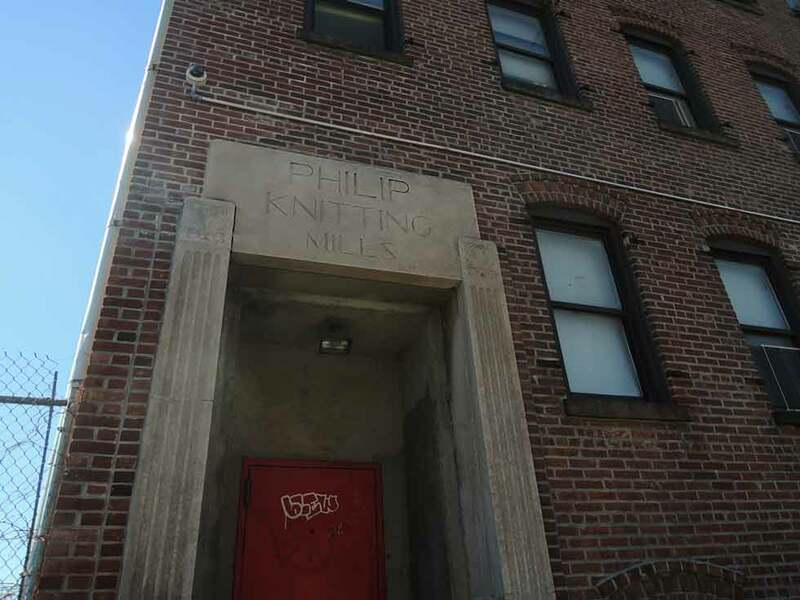 Philip Knitting Mills were located at 780 East 136th Street, on the southeast corner of Willow Avenue, the Bronx, from 1943 to 1976. The website Historic Districts Council / Six to Celebrate has the following to say about the building at 780 East 136th Street, "The Philip Knitting Mills on the southeast corner of Willow and East 136th Street was constructed in 1884 and features decorative brickwork on its cornice and window lintels. Its doorway on East 136th Street was later decorated with art-deco limestone details." The founder of Philip Knitting Mills was Morris Philip (1904-1999). In 1925 Morris Philip was 21 years old, an knitting operator, living with his father and mother on Tiffany St., the Bronx. His parents were immigrants from Hungary. In 1940 Morris Philip, age 35, lived with his wife, Sylvia, on Undercliff Ave., the Bronx, his occupation, "buyer, wholesale knitting." In 1944 a classified ad in the New York Times read, "Operators, Merrow, expd sweaters: war work; good pay, Philip Knitting Mills, 780 E 136 St. Bronx"
In 1990 Philip Knitting Mills published Morris Philip's autobiography, entitled Morris Philip: Mechanic, Mental Mathematician, Knitting Machine Inventor, An Autobiography of a 5th Grade Dropout. A comment at amazon.com reads, "One of the last great self-made, ingenious, mechanical inventors/innovators of the 20th century, Morris Philip founded and ran the Bronx's Philip Knitting Mills for many years. This is his story, full of business and inventing acumen and a lot of personal details. He is 'living proof that nothing -- not research teams, R&D departments, or scads of university-trained PhD's in mechanical engineering -- can replace a man with natural and extraordinary gifts....' - Walter Anderson"
Philip's autobiography is, indeed, an interesting work. Unlike most autobiographies of this kind by a successful business man, for the most part it does not indulge in self-congratulatory litanies. The parts about his early life are particularly interesting. He was born 19 May 1904 in New York City, but his mother took him back to Hungary (where she was born) in 1907. They returned to New York a year later, then went back again to Hungary in 1912. They then spent World War I in Hungary, and he came back to New York to stay in January 1921 when he was 16 years old. He tried school (in Brooklyn), did not like it, and soon took a job as a sewing machine operator in a necktie factory. His first job in the knitting industry was with the Storm King Knitting Mills in the Bronx at Park Avenue and 161st Street. He then moved through a series of jobs in knitting mills in New York. As a teenage workman in these mills he often irritated supervisors by suggesting changes to the manufacturing methods. Given the opportunity to show what he could do, he was more than successful, and soon became sought after as an expert machinist. His first patent Fashioning attachment for knitting machines (US patent 2004584) came in 1933, and he opened his own Philip Knitting Mills in 1935. This was located at 435 East 166th Street, the Bronx. By 1937 it had 100 employees. In 1943 he bought the building at 780 East 136th Street, and moved the business here. patentbuddy.com lists four patents issued to Morris Philip between 1980 and 1992. Some earlier patents were Knitting Machines (US Patent 3147605 published in 1964) and Knitting machine and method of knitting (US Patent 3298202 published in 1967). Another Philip patent was for a Splash-proof container and cover (US Patent 4322014 published 30 March 1982). Kevin Walsh's Forgotten New York says that the Philip Cup factory was located at 26 Bruckner Boulevard, the Bronx.